Created in 2002 by two hot air balloon lovers, « Les Montgolfières du Sud » are an SARL authorized by the Civil Aviation to transport passengers. Based in Blauzac, in the Gard, LMS operate from Uzès to offer flights above Uzès country and the Pont du Gard. The LMS pilots have chosen medium size baskets, to emphasise warm and direct contact with the passengers. The equipment is carefully maintained and checked upon. Marie and Jean can host you the night before the flight in a guesthouse in Blauzac. LMS developed the Cineglobe as they are often asked to shoot films or advertisements, it’s a small blimp destined to aerial shooting. LMS has a unique photo library of aerial pictures of Uzès and Pont du Gard Country. LMS have given several exhibitions of aerial photos and conferences on aeronautics : « Païolive, sacred wood » (2014), « History of aerostation » (2009), « On the traces of Nadar in a balloon » (2008), « Uzès Country » (2007), « Celestial drawings » (2006). Marie arrived in the Gard from Vendee by foot over thirty years ago. She loves tango and this sometimes-dry earth where she grows organic vegetables. 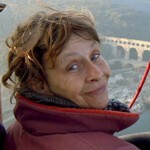 With over 300 flights in ten years, she is the only professional woman aeronaut in Languedoc Roussillon. Marie allies the determination of her Breton origins with her pilot’s sensibility to achieve comfortable and smooth flights. 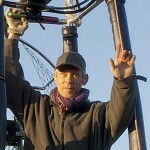 « The magic operates as soon as the balloon inflates on the launching site. The exiguity of the basket creates a unique moment with those on-board. There’s always something happening. Seeing a star twinkling in a passenger’s eye after landing fills me with joy.». A real girl in the air ! Aeronaut since 1979, Jean has spent over 2 700 hours flying a balloon. He arrived in the Gard in 1992, reporter and photographer he then became a professional free flight pilot. Every year he takes part in the French Hot air balloon championship, and became vice champion in 1999, and got a third place in 2012. Federal instructor-tester, Jean trains candidates for an aeronaut licence and qualifications as instructors. Pont du Gard seen from the sky. 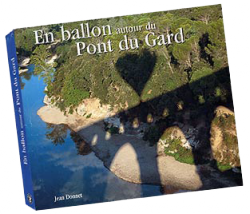 He has also published the beautiful book « En Ballon autour du Pont du Gard ». Lover of the air, the Garrigue and heritage, Jean is the ideal air guide to discover the region from a basket.